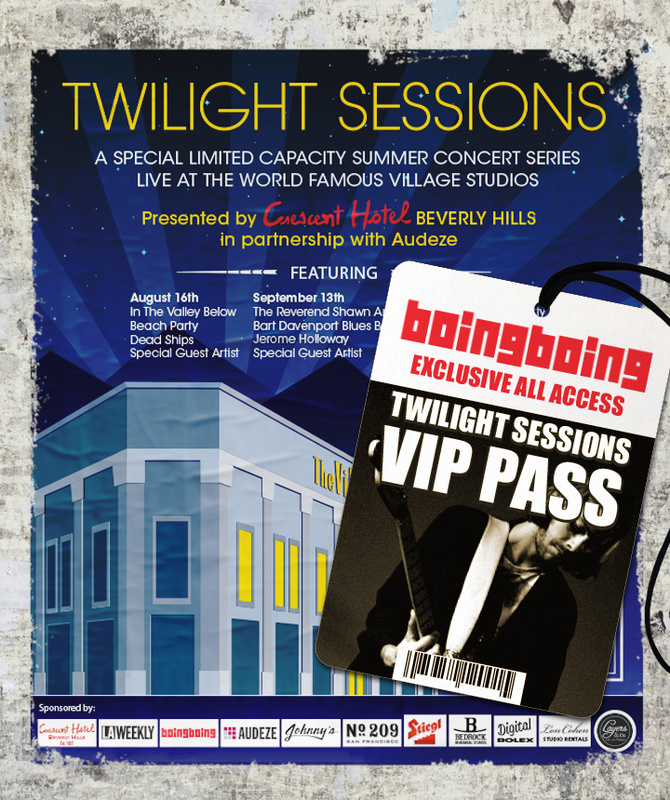 We're thrilled to offer 5 pairs of VIP, all-access passes for the August 16th installment of the Twilight Series, a music event held at The Village Studios in West Los Angeles. In addition to meeting some of the performers, including the Dead Ships and In the Valley Below, you'll get a private tour of the historic studios, join the crew in the control room during the live recording, and have access to the VIP lounge. The Village Studios are truly historic. Built in the 1920s as a Masonic Temple, in the early 1960s it became home to the Maharishi Mahesh Yogi's Center for Transcendental Meditation. In the late sixties, the building was transformed into a recording studio where hundreds of artists made music--among them, Aerosmith, The Allman Brothers, The Beach Boys, Mariah Carey, Johnny Cash, Ray Charles, Eric Clapton, Alice Cooper, Elvis Costello, The Doors, Bob Dylan, The Eagles, George Harrison, Weezer, Elton John, Tom Jones, B.B. King, John Lennon, Little Richard, The Smashing Pumpkins, and Ringo Starr. What I find so special about The Village is not just the beautiful building, but the community and generally great feeling I get by simply being there. Jeff Greenberg, the studio CEO, is truly an amazing and inspirational person. His deep love of music, musicians and their community is the energy the entire organization seems to run on. His stories about the studio and his struggles to make it work are wonderful. If you'd like to attend on August 16, send an email to inquiries@boingboing.net and the first 5 people to respond will get the passes. Deep gratitude to Audeze, makers of handcrafted headphones that provide an ultimate listening experience, communicating music’s emotional impact directly into your soul. Much appreciation to our beverage sponsor Distillery No. 209, makers of No. 209 Gin, a small batch hand-crafted spirit with a flavor for the 21st Century. Family owned Stiegl Brewery, where century old tradition merges with the latest brewing innovation.